Exhibition set up in Large Hall. 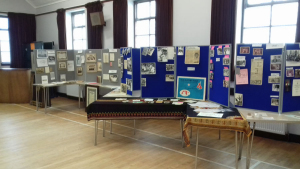 Our 175th anniversary celebrations included a three day exhibition of photographs and artefacts from our church history. From 21 to 23 August, literally hundreds of items dating from late 1800s to modern times were on display for anyone to browse with a cup of tea and shortbread. Reminiscing was obligatory with stories about Carluke town and its people across the years being shared amongst friends. It was thought that over 150 people attended across all the sessions. Dr Ann Jackson's Chief's Chair carved in wood took pride of place amongst newspaper clippings, pantomime programmes, oil paintings, silverware and sepia and colour photographs. All this would not have been possible without the dedication of Sandra Peat and Iris Nelson to the task, so on behalf of the whole Church, the biggest thank-you goes to them both.